Everett School Board Project: Rebuilding Public Trust or "Fool me once, shame on you. Fool me twice, shame on me"
Rebuilding Public Trust or "Fool me once, shame on you. Fool me twice, shame on me"
The last time an Everett School District Bond failed to pass was 1996. It got only 54% on the first try and barely over 60% on the second try in April of that year. To put it in an educational perspective, the students of the class of 2014 were newborns the last time a bond failed in Everett. It has been a generation since Everett voters told the district they didn't agree with their financial priorities. Historically, school bonds in Everett have passed with an average rate of just over 62% since 1980. They have passed with approval rates as high as 74% (1986) and failed with rates as low as 54%. Levies have passed with an average rate of 67% since 1980, so their 61% approval on the levy is still 6 points below their historical average. The 2006 Levy passed with nearly 68.5% approval. Clearly, a message was being sent by this year's voters. School board President, Pam LeSesne, said after the February 11 vote that the needs don’t go away because the bond didn't pass. To that we say, the needs were there long before this bond was put before the voters and the “Community Resource Center” was built. Parents, students and teachers knew that there was quite a bit of updating and remodeling that needed to be done and expressed their concerns over the district ignoring dangerous and decrepit conditions in our schools. But, concerns fell on deaf ears. The Everett School District claims that the money used on the new administration building was saved from projects, rents and leases over the last 20 years and, therefore, had nothing to do with the 2006 Bond. New School Board appointee, Caroline Mason, claimed the money came from State Construction Assistance Funds, not from local bond funds. So, which is the real truth? They keep throwing excuses at the taxpayers and hoping something sticks. But, the smoking gun that disputes their claims is that in 2011, despite their best efforts to get around it through legal counsel, they were obligated to amend the language of the 2006 Bond Resolution and change the number of it to add both the tracks at Jackson and Cascade AND the new administration building. Thanks to language in bond resolutions in this district, the lists presented to the public during a bond vote are non-binding. The school board can add projects as they see fit based on their decision that the need is greater than what’s on the public list. And, they did. Then they set a PR campaign in motion to try to convince the public that the $28 million was never meant for student facilities and came from some magic pot of money that wasn't from anyone they had to be accountable to. Meanwhile, North Middle School continues to fall apart around their ears and kids are breaking their legs on outdated grass fields that other school districts replaced long ago. Does it REALLY matter if the money came from their left pocket or right pocket? State Construction Assistance Funds were meant to enhance local bond funds so that they might do more for local educational facilities such as school remodels and construction. At no point, that we can find, did the Everett School District declare in the last 20 years that they intended to save money to build a new Administrative Office. It may have been a desire and a dream, but they never took it to the taxpayers and allowed them to vote on it at any point in any bond. The Citizens Bond and Levy Committee spent almost $15,000 on a phone survey last summer that was carefully designed to give the district a high level of false “public approval”. Each question gave you no choice but to pick a level of agreement. There was no room to disagree with their pro-bond statements. The same group phoned local residents in 2011 at a cost of over $10,000 to give the district a false sense of public approval regarding the “Community Resource Center”. The surveys were carefully crafted by The Public Affairs Counsel in Salem, Oregon. They are a political survey group who attracts clients by advertising their success in getting tax packages passed for government agencies. They are in the business of ramming these things through and marketing themselves through their success rate – hardly a fair survey. In fact, during the 2011 “Community Resource Center” survey, I asked who was conducting the survey and was given very vague answers that lead me to believe the survey taker was just a local citizen. The district also hosted 2 public meetings about the proposed $89 million new high school where they enthusiastically employed the Delphi technique of manipulation and crowd control. Attendees were broken up into small, manageable pre-assigned groups which included a district “handler” to guide the discussion. You simply could not offer counter-suggestions or speak against their proposals – the rules were made very clear in the beginning by the moderator. Groups were told they might have to “support projects they wouldn't normally support” and come up with only “positive statements” about the proposals. When some started to ask questions towards the end of the meeting and free discussion started to take place, the facilitator shouted over the growing dissent to remind people they were only allowed to ask question pertaining to the district's guided discussion. Once again, this creates a false notion of public support that the district can use against those who question their motives. I do not disagree with many of the projects on the bond. They are not all misguided or unneeded. We have some serious updating that needs to take place and I believe we need to teach how today’s students learn and employ technology in meaningful ways. However, I don’t feel like the district has done due diligence in giving us valid numbers based on real estimates and fair facts. I feel like they found the “sweet spot” that doesn't raise your taxes and then assigned some fairly arbitrary guesstimates to some heart-tugging projects without providing a lot of concrete information to the public. For example, few people I spoke to with children in the south end of the district knew that the proposed new high school won’t be built for about 10 years. It will not alleviate any immediate over-crowding needs and doesn't address future changes in the way students might attend high school. I asked the district if potential future changes to high school attendance such as the increase of online classes, the growth of Running Start and even charter schools were taken into consideration as possible ways to relieve over-crowding. The answer was vague but it was “not really.” Couple that with projections about growth that may or may not be correct. In 1990, the district was growing and their “experts” predicted that the Everett School District would have 20,000 students by 2000. We are 24 years past that prediction and we have yet to reach 20,000 students. What makes them so sure it will happen now? There is growth, but there is also maturation of households in the south end of the district that might mean more empty nesters and fewer households with children. Basically, it’s nearly impossible to predict. Let’s cross that bridge down the road. Why are we paying now for a high school we may not need in 10 years? Meanwhile, Everett High School is approximately 600 students UNDER capacity according to the OSPI capacity report. The School District recently started exploring ways to fill those seats. But, given that our 2006 bond funds just beautifully remodeled the Everett High School Gym and Little Theater, the district should be more determined to fill that school and more creative in ways to do it. Will we let EHS drain out for the growth at the other end of the district? We would still have to maintain and pay for that school. Why not use the space? 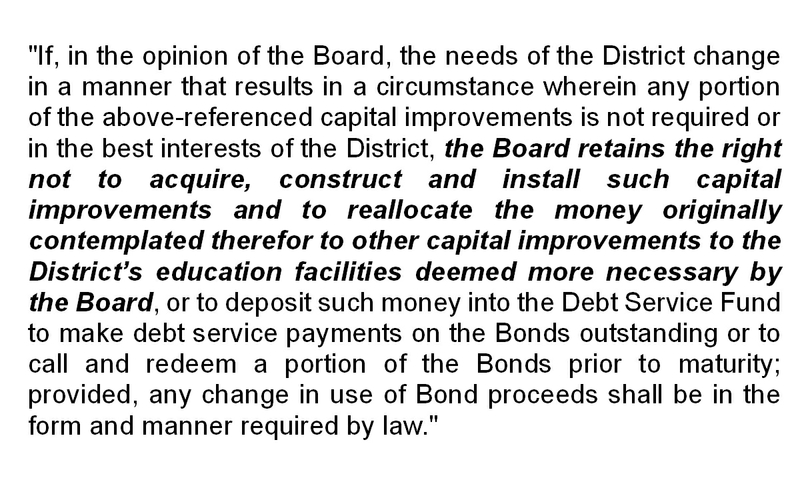 I expect the district will scramble to put together another bond package by the March 7 deadline. They are starting the process today (Feb 19) with a "study session" of the school board to discuss it. The next possible time we can vote on it is April 22. I am assuming they will ask again at that time to keep from having to do it during the August primary. School Districts like their bonds and levies to be conducted outside of regular election cycles. It keeps a large percentage of the voters away from it (thus ensuring only those voters most passionate about the schools bother to vote) and prevents them from having to present a Pro/Con position when the county produces a Voter’s Pamphlet. The question is…. Did they get the message? So far, they are pretending like they didn't. The Superintendent hasn't said a word publicly and the district PR person said she isn't sure why it didn't pass, according to press reports. One local story said they are “stumped”. Really? That’s concerning that we have an administration who is going to play dumb with the voters. They are quick to point out that it got over 50%. So what? It didn't pass, end of story. The proof will be in the next package. Will the package be more honest with binding language that requires them to ask voters about any deviations from the list of projects they present? Will they divide it into a “new construction” bond resolution and an “upgrade/technology” bond resolution and allow us to vote on projects independently? Or, will they prioritize and ask JUST for immediate needs now? That would mean less money and lower taxes. And, we all know that the idea of letting anyone’s taxes go down strikes fear into the heart of every government agency. Or, will they present the same package and just ratchet up the platitudes and emotional pleas about it being “for the kids” and “the right thing to do”? I am sure they are calculating that they need just 2% more for it to pass. Was it a clear message from the taxpayers or a minor inconvenience and “misunderstanding” they will aim to “correct”? As the old saying goes, “Fool me once, shame on you. Fool me twice, shame on me.” This is an opportunity to re-build public trust. Will they do it, though? We will know on March 7 when they submit the new package.